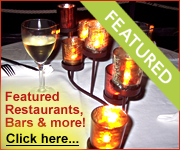 Use the Barbados Restaurant Search to select any combination of criteria such as cuisine, ambiance and price. Enjoy the amazing atmosphere and tasty food at the famous Oistins Fish Fry, followed by a nightcap at a local rumshop! Enjoy a 3 course dinner, including a bottle of wine per couple, tax and service charge, at top Barbados restaurants for US$50 per person! And save 10% on lunch at many local restaurants.